Chipbreaker style insert routerbit with offset inserts. 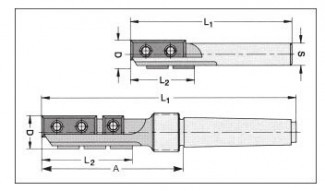 6220 style (shown on the left) uses 3 inserts for a 34mm cut length, and 4 inserts for a 45mm cut length. 6222 style, shown on the right, uses 5 inserts to achieve the 50mm cut length. Suitable for pre-cutting and cut-out operations in solid wood and composite materials where finish is not extremely critical. 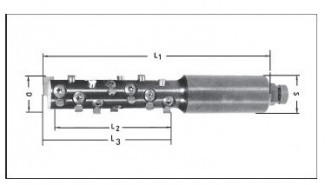 A spiral router bit designed for roughing/hogging composite materials and solid woods. Not recommended for finish cuts. Replacement tips available in carbide and diamond with straight, 8° up shear or 8° down shear cutting styles. The Novitec is supplied with straight carbide knives unless specified otherwise. For high feed rates!